This blog is being published both on my own site and at MySpace. I started about two months ago and I enjoy doing it very much. But one of the reasons why I started this blog, was to try and reach a wider audience than the 25 people that I reached with paper and pen. So far the opposite has happened: the few people that read my fanzines don’t read this blog and there are not much newcomers either. For more than a month Tom was my only friend on MySpace! But since two weeks I have a real friend!!! He calls himself Sounds from the pocket and we share an interest for Found Sounds. We agreed to trade some material over the mail and in the first package that I sent him was a CDr called The Magic of Recorded Sound. It was originally a cassette, that I recorded seven or eight years ago, when I was deep down into Found Sounds. Having my first friend on MySpace seemed like a good excuse to make a CD of this tape. Not all the material on the CD is truly found by me, but much is. 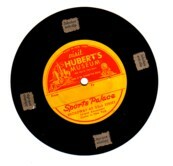 Like the three Voice-o-Graph records, that a Dutch sailor recorded at the Sports Palace Amusement Centre in New York, more than 50 years ago. 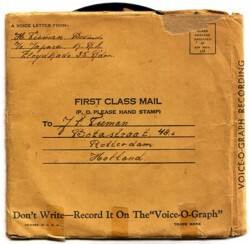 He has nothing special to say, he just wanted to please his parents in Rotterdam with some records in stead of a postcard. He is just blabbering about his stay in New York and singing a bit, but I love records like this! More than any other medium these one-of-one records make me aware of the mystery that time is.And I cannot imagine that Tom and I are the only persons on MySpace who love such recordings. Heeej Frits, wat is jouw adres op MySpace dan? Ik heb gezocht op je naam, maar vond niets. My dad pasted away in March of this year. 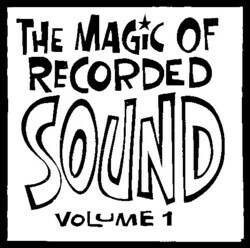 Just this week I found 4 Voice-o-graph recordings he made in 1952. Any idea where I could go to have these cleaned up and the content played and maybe recorded on CD? I would love to do that. But then you have to send the records to me, which is not a good idea.